It's been learnt that authorities of the Presidential Villa, Abuja, have formally removed officials of the Department of State Services from positions where they can perform 'close protection roles' for President Muhammadu Buhari. The decision to restrict the officials’ access to the President was the peak of the inter-agency rivalry that has been rocking security agencies in the seat of power since Buhari was inaugurated on May 29. 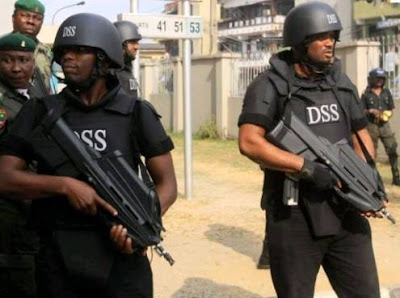 The ADC directed personnel of the Armed Forces and the Nigeria Police who he said were trained as presidential body guards to take over the DSS officials’ duties of providing “close and immediate protection” for the President with immediate effect. Abubakar explained that the decision to strip the DSS officials of their roles was part of an effort to enhance security within the villa which was necessitated by 'recent events' but he didn't say what the events were. He listed the beats and locations from where DSS officials were withdrawn and replaced with PBGs to include the administrative reception and passage; service chiefs’ gate; residence reception; resident gate and office reception. “However, the personnel of the DSS in conjunction with other security forces are to man other duty beats and locations within the immediate outer perimeter of the Presidential Villa,” the ADC wrote. Meanwhile, officials of the DSS who were chased away from their beats on Wednesday were also not allowed access to their duty posts when they resumed work on Thursday morning. Their beats had already been taken over by plain-clothed military personnel. Many of them were seen under the trees discussing the development in hush tones. Those who were manning the two of the gates leading to the villa as well as the gate of the old Banquet Hall were however not affected as they were seen at their duty posts. Some of them wondered why whatever issue that could have arisen could not be resolved with the DSS authorities. “If they feel that the DSS erred during the campaigns, some of us expect that they should also vent their anger on the management and not the entire DSS who served the President bewteen 1984 and 1985,” one of them said. The Presidency had in a statement by the Special Adviser to the President on Media and Publicity, Mr. Femi Adesina, on Wednesday said Buhari had not given any order for the expulsion of DSS officials from the Presidential Villa. However, Adesina has admitted that a reorganisation of security at the seat of power was underway.